The Blakeney Farmers’ Market & Craft Fair returned today and it was another good showing. Hosted on the 2nd Saturday of each month, it has about 20 stalls, which impress with quality, locally produced food and craft at reasonable prices. 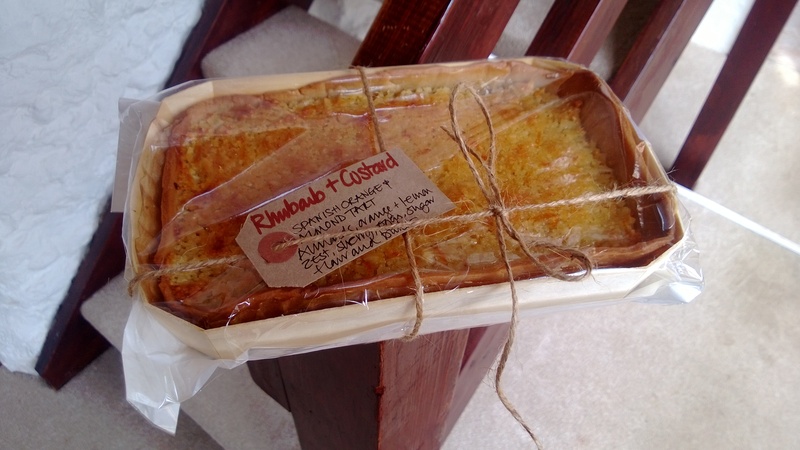 One particular find was Rhubarb & Custard, run by Bridget Bennet (the web-site doesn’t seem to be up and running yet, but they’re on Twitter @rhubardpuds and hopefully she’ll be back at the market next month). They had a delicious Apple & Maple Icing Pudding, but we chose the Orange & Almond Tart. Beautifully presented in a wooden tray, the tart has a great texture, with granular chunks of almond, complimented by a moist layer of zesty orange jam and a pastry base. It is rare to find a genuinely different kind of cake which surprises with its form and taste. This was one of those and a splendid discovery.